On this tour, students are launched into an action packed round trip from Sydney into rural NSW. See the natural beauty of the Blue Mountains and learn about life in colonial Australia in the Bathurst Goldfields. Then enjoy an exciting overnight camping experience at the Taronga Western Plains Zoo and check out incredible geological formations in the Jenolan Caves the following day. In Sydney, explore and learn about the Sydney Opera House before stepping aboard a cruise to see Sydney’s spectacular sights and attractions from the Harbour. On the move Make your way to Sydney and be greeted by your coach drive for transfer to your accommodation. Blue Mountains Journey to the breathtaking Blue Mountains, famous for its rock formations and scenic views. 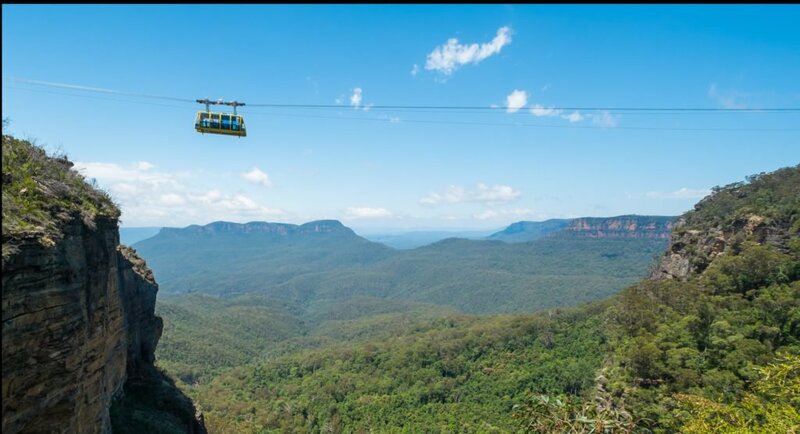 Ride the Scenic Cableway, a glass walled cable car taking you 545 metres into the Jamison Valley Rainforest from the top of the escarpment. At the bottom, stroll the scenic walkway through the rainforest before riding the steepest incline railway in the world. En Route to Bathurst Make your way to Bathurst and check into your accommodation for the next two nights. Bathurst Goldfields - Life in Colonial Australia (Part 1) In this 2.5 hour educational program, students will move through the colonial village and look through a range household items of the miners. Students will also learn about the Chinese presence in the Goldfields and the problems and prejudices they encountered. Hartley Historic Site In a 1.5 hour "Hartley Courthouse & St Bernards Church' guided program, students will learn about the European settlement of Hartley and how this related to the British colonisation of Australia and world exploration. Australian Fossil & Mineral Museum In this 1.5 hour guided program, discover ancient specimens from deep within the earth and learn about our natural history through fossils and minerals. On the move Check out and head to Dubbo, a rural hub of agriculture and recreational activities. Royal Flying Doctors Dubbo Take a 50 minute guided tour of the RFDS Dubbo Base and climb aboard the aeromedical simulator complete with a cockpit and full medical fit out. Learn about medical equipment, services and operations of this aviation icon. Taronga Western Plains Zoo Dubbo Enjoy an overnight Aussie bush camping experience at the Zoo in pre-erected tents and looking out over a Billabong. Search for native animals by spotlight on the exciting night walking tour. Jenolan Caves Stop over for a fascinating 1.5 hour tour of the oldest discover open caves system, the Lucas Cave. Experience rare wildlife, unchanged and contrasting ecosystems as well as geological formations wilder than the imagination. Captain Cook Cruises Onboard a narrated boat cruise, explore and experience the spectacular sights and attractions on Sydney Harbour. Shop and Explore in Darling Harbour The Darling Harbour entrainment district is home to several of Australia’s most popular attractions, including Harbourside Shopping Centre, the Southern Hemisphere’s largest IMAX theatre, the Sydney Aquarium and Madame Tussauds Sydney, a world-famous wax museum. Thank you for your interest in our WorldStrides New South Wales Cultural Tour Tour! Please tell us a little more about yourself so we can get you sent to the right place.